At least twice a day, I climb down from my rooftop perch and venture out into the neighborhood. Walking through the village is a cultural experience that I always enjoy. Every morning the women are out sweeping their own bit of sidewalk and the street in front of their houses. I imagine that they start at the back of the house and just keep going right out the front door and into the street. It is also a time to greet each other and exchange news and gossip. At the very minimum, a "Buenos dias" is exchanged with everyone who passes by. When walking along the sidewalks, an open gate can offer an interesting peek into a private world that is hidden behind plain, and often crumbling, walls. Many of the properties are very narrow but deep, and almost all seem to have patios and gardens hidden inside. Sometimes, all that faces the street is a door opening onto a long dark hallway that leads to a house and garden in the back. These internal gardens are planted with avocados, oranges, mangoes, limes, bananas, bougainvilleas, honeysuckle, and jasmine. The variety is endless, and every conceivable kind of container might be used as a flowerpot. From my top floor, I can see much of the square block where my house is located. The entire outside edge is narrow buildings packed tightly together, but the whole center looks like a forest of large trees of many different kinds with an occasional glimpse of a rooftop patio. I live at a very convenient corner. Next door is a small tienda - a tiny grocery store - that carries an amazing variety of goods. I can buy eggs or envelopes one at a time, Diet Coke, milk, cheese, juice, candy, chips, toilet paper and fresh tortillas plus a variety of breads made fresh daily. Across the street is another tienda that sells fruits and veggies, bottled water, and a few canned items. A few doors down is a laundry where I drop off my dirty clothes in the morning and pick them up that afternoon, clean and neatly folded. They charge according to the weight of the clothes; I usually pay about $1.50US. The small, densly packed houses in this neighborhood mean that there is lots of activity from 7am to about 10:30 or 11 at night. Trucks drive up and down the streets daily with loudspeakers announcing their wares: propane gas, purified water, or fruits and vegetables. A man pushes a wheelbarrow and calls out in Spanish, "Honey from bees"; another pushes a cart with ice cream and stacks and stacks of cones. One day I watched a Huichol Indian in traditional costume as he walked up and down these steep streets playing a flute and keeping time with some sort of wooden bells attached to his left ankle. A teenager, maybe his daughter, moved up the block with him, knocking on metal doors and gates (with a coin so the sound would carry well) and hoping for donations. It gets quiet in the heat of the afternoon, but as the sun sets, the streets really come alive. The men come home from a long day's work and clean up. Music is playing in many of the houses but rarely loud enough to be unpleasant. Front doors and gates are opened and whole families may be sitting out on the sidewalk--old people in chairs or on stumps placed near the doorway for that purpose, the young seated on the curb, and little kids playing soccer or jumping rope in the street. Teenage boys call to each other with distinctive whistles while girls of the same age tend younger kids and giggle with their friends. 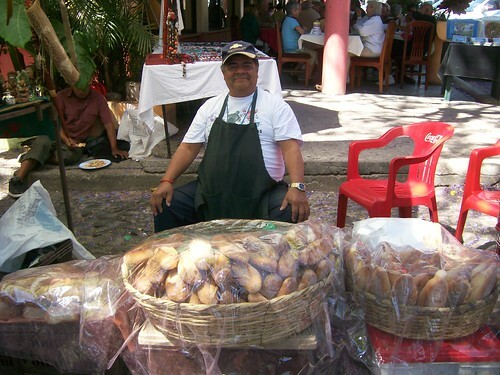 Some of the families set up tables in front of their doors where they offer for sale little candies or maybe some avocados or limes from their yard. Most blocks seem to have a family that goes all out and has a taco stand or serves some other hot meal. Neighbors stroll around visiting with each other and catching up with the day's events. By around 10:30, or earlier if the nightly thunderstorm moves in early, everyone has headed home and the streets are quiet once again. I quickly adapted to getting up and going to bed with the rhythm of the neighborhood. Many nights, the last thing I hear is the sound of horses' hooves on the cobblestones. I figure it is the Indian farmers coming home from tending their fields high up in the mountains, but I may never know for sure.